Comfort – Obviously, sleeping in a hammock is much different than sleeping on the ground or in a bed. There needs to be some “practice makes perfect” attitude applied here. I’d recommend setting the hammock up in a backyard or park and take a few naps in it before going for an overnight in the woods, especially without a backup plan. By making the hammock more taut between the trees, it will sag less, making for a more comfortable night’s sleep. Rain – Nobody wants to get wet. There are several easy solutions, however, to keep you nice and dry. First, you will most likely be under the cover of trees anyway. Second, set up a rain fly over the top using a tarp. 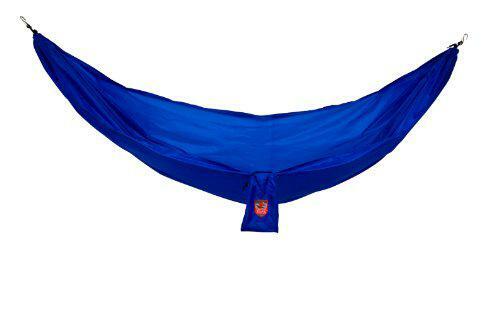 Third, and my personal favorite, take a tarp and fold it hotdog-style over the top of your hammock. With two carabiners or rope, tie the two corners at each end together. Until the rain starts, push the tarp up to the end of your hammock above your feet so it’s out of the way. If you start to feel droplets falling, just pull it over the top of you. Warmth – Okay, so I spent one of the coldest nights of my life in a hammock. There’s nothing underneath you, so your backside loses all its heat. This definitely isn’t the ideal sleeping solution for winter! But on a warm summer night, it’s perfect. For spring and fall, try putting a sleeping pad underneath you in the hammock to help keep the warmth in. Use the tarp idea as well to help trap heat from escaping out the top. Lastly, just use a warm sleeping bag. The Ultralight model is made of thin nylon which keeps you cool, but is again super lightweight. There are other styles and materials available for a warmer night’s sleep. No Trees – Be creative! Tie off to a rock, stump, or anything else you can find. I’ve even seen a hammock tied off to hiking poles, but I’d make extra sure your poles are tight and secure. Falling out of a hammock is no bueno. 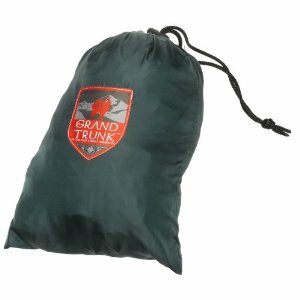 Be sure to check out the Ultralight from Grand Trunk. It comes in several different colors and there’s nothing better out there as far as price for the quality you get! A lightweight, sturdy, and comfortable hammock for only $20?! Yes, please!